Un-finished, uncoated, recycled aluminum metallic mini-blind, offered with 1" or 2" vanes. 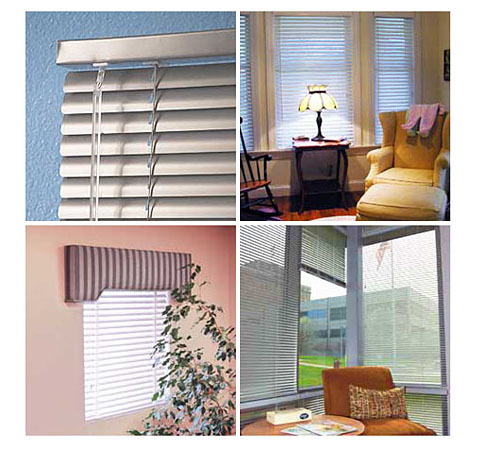 These durable, lightweight, versatile, and economical blinds should not be confused with today's standard pigmented polyester coated mini blinds from other manufacturers, which renders them unsuitable for customers with chemical sensitivities. Green Crafted: 92% made in the USA including ultra recycled aluminum and minimal use of molded plastic. With 6 gauge aluminum more prevalent, our premium 8 gauge (.008") slats are spring tempered and crowned for maximum durability. Our light weight and smaller package results in a much lower footprint overall furthering your green dollars! We further reduce the footprint through decreased supply space, weight, and waste by using rolled goods as the thoughtful basis for our shades. Versatile Control: Raise, lower, or adjust the vanes to maximize daylight, privacy, and dim light. Our routless vanes offer maximum privacy and light control providing beauty, practicality, and durability without the signature "pin-holes" of other venetian blinds. Colors: Silver or anodized silver! Just neutral enough to compliment almost any décor. Upon contacting every major raw material foundry for metallic shades in the US and Asia, we found only a small handful remaining; ALL have moved away from the once standard powder coating, touted and recommended in Green Living guides, to a polyester and solvent based pigment and finishing system. While we continue to build this relationship we are happy to make raw or brushed, unfinished aluminum Better-Blinds available to you today. Child Safety: The buzz around the industry includes "cord free" operation or lift. This feature typically removes the lift cords leaving the tilt ladders and internal lift cords providing a false sense of security, in our minds at a premium cost. Additionally, this technology uses spring tension drives that wear over time. Our shades incorporate the latest in blind safety construction providing true integrity.